Every Thursday morning Amadia Djali teaches an arts lesson to their third grade class at George Washington Carver Elementary School. Amadia is a new member of our beloved teaching artist team and this is one of their first residencies with the Workshop! Amadia taught workshops for youth and adults for 5 years before joining the Workshop team in October 2018. They have studied art, performance, and music, informing their work as the creator and director of a performance art project called Mother Tongue. Amadia has also been a costume designer and has exhibited visual installations and performance art at various Bay Area venues, such as Alchemy Collective Cafe, Omni Commons, and SOMArts. We’ve been getting to know Amadia this fall, and a few staff members had the opportunity to visit their class and see what fun projects the students were working on! When we walked into the classroom, Ms. G — the homeroom teacher — was dismissing the class for recess. Even though the sun was shining through a blue sky and the playground beckoned, almost half the class stayed inside to help Amadia prepare for the day’s activities! That day, the class was beginning an abstract sculpture project for their Workshop residency. 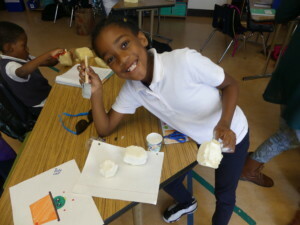 Through the next few lessons, Amadia planned to work with the students on constructing the sculptures out of foam shapes and toothpicks, which they would later paint with animal print designs. Because we visited on the first day of the project, the students (who skipped recess for art!) were preparing by dividing up the large blocks of foam into smaller rectangles that could be refined further in class. Once all the students were back in the classroom together, Amadia began the lesson with a brief overview of the sculpture project and visuals of relevant artists’ work to derive inspiration from, such as Dan Lam, AJ Fosik, and Nick Cave. The students responded intermittently with “oohs and aahs” as Amadia transitioned between examples of the artists’ sculptural works. 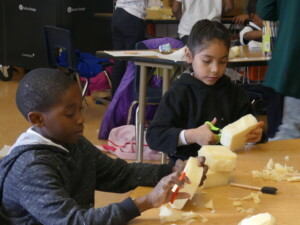 Stimulated by the presentation and equipped with new ideas, the students began constructing their foam pieces into shapes of their own imagination and design. They ripped, cut, and squished their foam using scissors and their hands, creating their own unique objects. Each student personalized the work, some modeling their foam after textured objects such as cacti, swiss cheese, or trees, and others creating entirely new abstract forms. As they finished in their own time, each student began painting their finished shapes with white acrylic paint to harden the foam and make a base for their sculptures. Using both paint brushes and foam brushes, everyone found their own brushing techniques and excitedly shared them with their classmates! When the paint started running low, the students began squeezing the foam shapes they had already finished to expel excess paint and use it again. 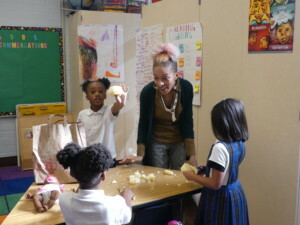 To say the least, the students enjoyed finding creative new ways to ensure the fun didn’t stop! It was inspiring and heartwarming to hear and see in person the passion and excitement the students had for artmaking, and Amadia’s teaching methodology. In future classes the students will practice sketching animal prints, use those prints to paint their foam shapes, and then connect all the pieces together to form their abstract sculptures! We are excited to see the finished products, and feel lucky to have been part of the creative process!